This annual race is held just north of Abergavenny. Starting with a loop around a field with a large barn and significant solitary oak tree in it, the runners are off towards the Skirrid. A 1.5K continual climb through fields, painfully runnable for many, brings competitors to the start of the open fellside. The path off right goes diagonally up the mountain’s flank to end abruptly on the ridge. The course crosses straight over, picking up an initially vague sheep trod, which soon becomes more defined but a bit technical amongst the rocks, bumps and dips, descending towards the forest edge. Well before the forest is reached, the track levels off and hits the steep little ridge. No time to stop and admire the view: straight down the north face. A mad dash through the fields and the finish awaits. Forest of Dean AC was represented by Mark Mathews and Mark Blake. 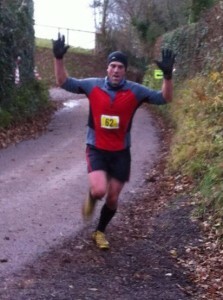 Mark M finished in an extremely good 7th place overall in 35:32, and Mark B 30th in 41:32, one minute quicker than 2012. The winner was Duncan Birtwistle (Harrogate Harriers) in 30:50 and first lady was Niki Morgan (Chepstow Harriers) in 39:34.